The Living Kitchen is the show where real food, food intolerances and preparedness become a sustainable lifestyle. 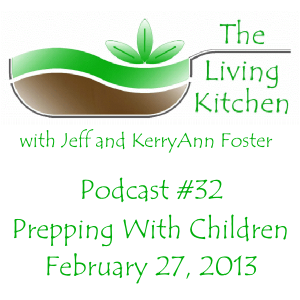 This week on The Living Kitchen, KerryAnn and Jeff discuss prepping with and for children. How to discuss preparedness with your children, how to teach them needed skills and what items to have on hand for them. My entire world just got turned upside down. Many of the foods I have believed are healthy have actually been hurting me. Many of the foods that are considered healthy, all of the plant foods that are considered to have quality nutrition in them, all have high levels of oxalates. Why? Because oxalates are bound to the nutrition in the food. For years now, I’ve eaten almonds, kale, spinach, chard, beets, asparagus, very dark chocolate, quinoa, chia, soaked grains, sweet potatoes and more. All are foods that are considered to be highly nutritious for plant sources and some are considered super foods. And I won’t even go into the list of supplements that contain oxalate. It’s quite depressing. However, if you have a damaged gut, you might be doing more harm than good. When your gut is leaky, oxalates can enter your bloodstream through gaps in the intestinal mucosa that aren’t supposed to be there and wreak havoc on your body. When your gut is damaged, the beneficial bacteria you should have in your gut meant to break down oxalates might not be present. You might have oxalate crystals stored in various areas of your body, causing many problems. Your supplements, your herbs and your food may be contributing. Oxalates in your body tissues are a huge roadblock to healing. I’m now beginning to see that this might be why I haven’t fully healed. The problem is that there is such an emphasis on the Bristol Stool Scale as a measure of gut health, yet I’m learning that the bristol stool scale isn’t the end-all and be-all for gut health. For years, I’ve heard about the importance of where you fall on the scale as a measure of gut health. However, I have consistently registered where I should on that scale for years (between a 3 and a 4), yet I still have a leaky gut as evidenced by me having an oxalate problem. So if your poop can’t tell you if you have leaky gut, how do you know? I’d say based on my experience that many people probably have leaky gut and think their digestion is healed when it is not. You can still have leaky gut without having any gut symptoms. If you have a health problem, it’s possible you might have a leaky gut and you might be having oxalates get into your bloodstream, causing problems for you. If you don’t have leaky gut, you don’t have an oxalate problem. If your digestion is doing as it should, oxalate can’t enter the bloodstream except in very small quantities. You can consume high oxalate foods in reasonable quantities. However, even with a healthy gut, if you consume huge amounts of high oxalate foods, like almonds, chocolate or spinach, on a daily basis, you can still cause yourself harm as some of it is being absorbed. 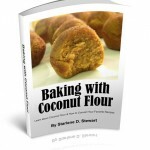 People who consume grain-free baked goods that are made with almond flour daily or eat large spinach salads regularly can hit upon problems despite a lack of leaky gut. Just one leaf of spinach has more oxalate in it than what a person on a low-oxalate diet can consume and excrete in one day. Oxalate is a plant poison. It is a natrually-occuring anti-nutrient in plants that acts as a defense mechanism. If the plant causes pain, inflammation and other bad side effects for the creature that eats it, that creature is unlikely to try to eat another plant like it. If you have a healthy gut, your body will likely only absorb a very small amount of oxalate, around 2-3% of what you consume. At that level, your kidneys are likely able to excrete it- your body has a set limit of how much oxalate it can excrete through the kidneys in one day. Oxalate is, by and large, meant to stay in the bowel, exit the body and never enter the bloodstream. If you don’t have a healthy gut, then your body can absorb large amounts, around 50% of what you eat, and your body can even manufacture oxalates under certain conditions. The oxalate enters the bloodstream via the gaps between the intestinal cells that aren’t supposed to be there and lodges in any tissues that the blood can reach- in other words, oxalate can lodge anywhere in the body. My symptom that is on the list above is eye pain. I don’t have pain anywhere else in the body. In just going off of chocolate, I’ve seen my eye pain improve, only to see it return within a few hours of eating almonds. I’ve had worsening eye issues since this Summer, including pain, burning, blurry vision, eye dryness and even some blind spots. If my eyes have improved with just going off of chocolate and lessening almond, I hope that some of the problems I am experiencing with my vision will continue to improve as I go through more oxalate removal from my tissues with the low-oxalate diet. While the pain and burning problems are directly connected to oxalates, I’m not sure about the other issues. We will have to see. When oxalates hit your blood stream, they can be excreted by your skin, lungs or kidneys. However, there is a limit to the amount of oxalate a person can excrete in one day, healthy or not. The rest gets stored somewhere in your tissues. When you go low-oxalate, they can then dislodge themselves, enter circulation and can be eliminated. This results in cycles where you see symptoms come out, the oxalates clear through your system, and you feel better for a while before it starts again. I expect that I will soon enter this cycle as I slowly reduce my intake. Then there’s this little gem. A study done in 2002 showed that while almost all children have Oxalobacter formigenes, the beneficial bacteria that breaks down oxalate, in their guts, only 60-80% of adults do, and most people with an inflammatory bowel disease don’t have it. Celiac is classified as an inflammatory bowel disease. And Oxalabactor is very sensitive to certain commonly-prescribed antibiotiocs. Antibiotics that I know I took before I turned to natural medicine in 2002. Currently, if you kill off the Oxalobacter in your gut, there’s no known way to get it back, as Oxalobacter is an obligate anaerobe- it dies very easily in the presence of oxygen. Currently, there are no commercially-available supplements that contain it on the market, as it is extremely difficult to produce these types of probiotics and have them remain viable until ingestion. However, the people in studies who have been given Oxalobacter have shown colonization (it stayed in their guts and took up residence) for months after a single dose, with improvements in their health and a drop in the amount of oxalates they were excreting, showing that the Oxalobacter is doing its job of breaking down the oxalate in the gut. In addition, your body can produce oxalates in the liver in response to certain diseases or nutrient deficiencies. Oxalates can also bind to heavy metals in the body, making them even more dangerous. I went through chelation in 2009-2010 and have had heavy metal problems in the past. Yes, I am frustrated. My ‘healthy’ diet has been contributing to me feeling worse, not better. And I’d bet there are at least a few readers who are frustrated that their health isn’t improving despite hard work, so I’m writing this in an attempt to reach those readers. If you aren’t healing despite normal stools or new problems are developing, please consider that oxalates might be part of the problem. Surf around a little and you’ll find conflicting info on how much oxalate different foods contain. In fact, much of the info out there is old or outdated. Testing methods have improved in recent years. The best help I have found so far is in the Trying Low Oxalates Yahoo Group. This group is testing foods to determine oxalate levels and has the most up-to-date listing of the oxalate content of food that I’ve been able to find. They’re also full of support on how to transition onto a low oxalate diet (LOD). The LOD is where I’m headed right now. When beginning the diet, it is important to very slowly reduce your oxalate intake. A sudden drop, especially if you’ve been eating a lot of the ‘highly nutritious’ foods listed above, can bring on nasty symptoms and possibly kidney stones. As your intake decreases, the body begins to release the oxalate it has stored, which puts it back into circulation. From there, your kidneys must deal with it in order to get it out of the blood and out of your body. Your kidneys can only filter so much at one time, and excess circulating will only cause pain and misery for you. In the coming weeks, as I learn more, I will blog about my findings, more about the above topics I’m just glancing on today and how I am progressing on the diet and what I am (and am not) eating. If you have a leaky gut, I would urge you to read up on the low-oxalate diet, consider if it is possibly a problem for you, and maybe even try reducing your oxalates to see how you feel or if they might be an issue for you. If you’re consuming a lot of high oxalate foods, I would encourage you to cut back on them in order to prevent problems if one hasn’t yet developed. 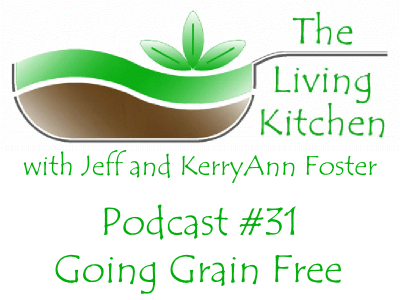 The Living Kitchen is the show where real food, food intolerances and preparedness become a sustainable lifestyle. 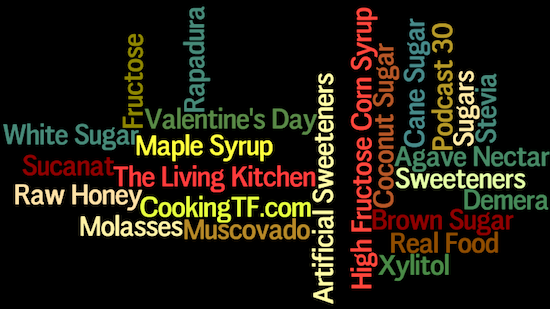 This week on The Living Kitchen, Jeff and KerryAnn cover 26 different sweeteners. 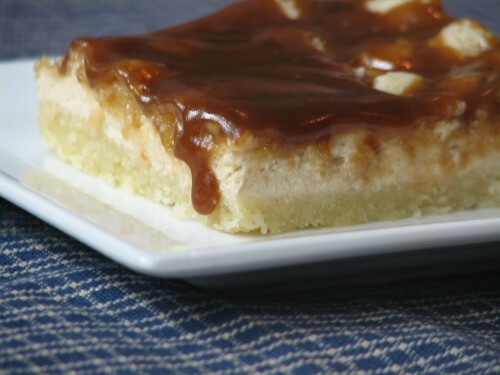 We discuss whether or not each sweetener is real food and why, how to use them, how to store them, and more. Come join us for a very sweet Valentine’s Day episode.